Most stores put their Halloween decorations out weeks ago, and some have even stocked their Christmas aisles. While that may be a little early for some shoppers, it’s a clear sign that like it or not, winter is on its way. And if you work in facilities management that means you’ve got some roofing maintenance to do. In many parts of the country, winter will bring freezing sleet and rain, heavy snow, and sub-zero temperatures. That means you may have fewer opportunities to get up on your roof to perform needed repairs, so it’s important to do your roofing maintenance before winter weather sets in. Trim any low-hanging branches from around your roof. Ice and snow can cause branches to break and fall on your rooftop, causing damage and an insurance nightmare you don’t want to deal with. Remove branches, leaves, and any other debris from your rooftop. In addition to providing a medium where mold, mildew, and fungi can grow, it can wear down your roof’s membrane. Leaves and other debris can also cause a buildup of rain and snow (including ice dams), which can lead to leaks and other problems. Clear leaves, debris, and other blockages from your gutters and downspouts. During the debris removal, look for signs of sagging or overflow, which could indicate that your gutters aren’t up to the task of draining water from your roof. Water overflowing from your gutters can damage not just your roof, but the building’s foundation, as well. Check for signs of leaks, both externally and on internal ceilings and walls. If you find any, repair both the leak itself and any damage that has occurred. 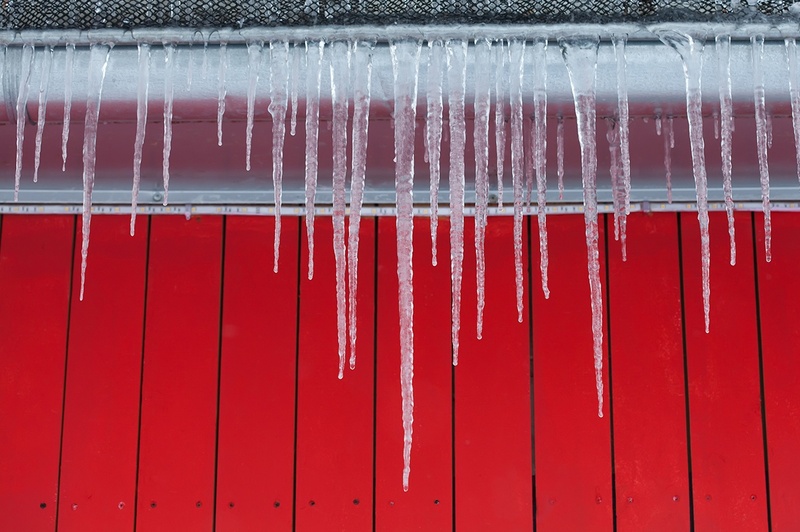 Remember to check things like flashings, skylights, and any places where roofing equipment or pipe supports penetrate the roof, and seal where needed. Repair or replace any loose or damaged shingles. Before the first snow falls, make sure you know your roof’s maximum load capacity. One cubic foot of fresh, powdery snow can weigh as much as 20 lbs., and wet, packed, or refrozen snow can add up to 60 lbs. per cubic foot. Have a snow removal plan in place in case you need it. If your technicians aren’t trained in snow removal, either provide training or contact a snow removal service. Incorrect snow removal procedures can easily damage the roof. Inspect the roof itself and look for loose expansion joints. When joints expand and contract due to icing and temperature changes, the movement can create entry points for snow and ice. Inspect the roof membrane for holes, tears, and thin spots, and make repairs as needed. Inspect rooftop walkways and steps around pipe supports to make sure they’re firmly secured and in good condition. Unsteady or damaged walkways present a slip hazard in icy conditions. Inspect HVAC units, pipes, pipe supports, and rooftop equipment for signs of damage or leaks. Freezing temperatures and expansion caused by ice can turn small problems into big problems. Inspect the edge of the roof – both from ground level and from the rooftop itself – to look for gaps and inconsistencies. Weaknesses in the roof edge are one of the primary routes for water incursion. It’s a cliché for a reason: “An ounce of prevention is worth a pound of cure.” Roof repairs are costly even before you add in any associated damage. A leaking roof can cause massive damage to a building’s interior, including the possibility of destroying irreplaceable data and documents. In addition, if the damage is severe enough to halt operations while you wait for building or equipment repairs, the resulting loss of business can be catastrophic. Make sure your roof is up to the task of keeping your building and everything in it warm and dry by doing your roofing maintenance now before winter arrives with all of its cold and bluster.